Cytology, the microscopic examination of tissue samples spread onto slides, is a powerful tool for evaluation of skin lesions in small animal patients.1 In many cases, cytology can provide a definitive diagnosis for cutaneous masses. In others, sample evaluation can rule out some differential diagnoses and help the clinician choose the best next diagnostic test to perform. The first critical step in the use of cytology is obtaining and creating a good cytologic sample. In vivo collection technique can be performed with a needle alone (fenestration—this author’s preferred technique) or with a syringe attached to the needle (aspiration) (see What You Will Need); both of these techniques are typically called fine-needle aspiration (FNA). Before obtaining the sample, lay at least 4 to 6 slides in a row. Stabilize the mass in your nondominant hand. Direct the needle into the mass. Rapidly withdraw—yet stay within skin—and push back into the mass several times before removing the needle completely. Draw several milliliters of air into the syringe, connect it to the needle, and expel the needle contents onto a slide. Make sure the bevel is down and the contents are expelled near the frosted end of the slide. Connect the needle and syringe, direct the needle into the mass, and draw back and release the plunger several times. With pressure released, withdraw the needle from the mass, disconnect the needle, and draw several milliliters of air into the syringe. Reconnect the syringe and needle; then expel the needle contents onto the slide. Slide preparation is key for good cytology results. For best cellular evaluation, the samples must be smeared—in a thin layer—quickly to prevent clotting or drying. Smearing is important even if only a small dot of the sample is expelled onto the slide. If cells dry in a little round puddle of fluid, the slide is difficult to assess because the cells maintain more of a 3-dimensional appearance and their cytoplasm is not spread out. 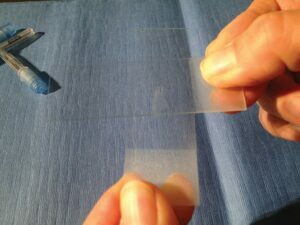 Use a second slide (smearing slide) to lightly touch the top of the sample, adhering a small amount of sample on its underside (Figure 1). FIGURE 1. The slide in the left hand is the sample slide; the slide in the right hand has been lightly touched to the sample, adhering a small amount of sample to its underside. Smear the sample from the smearing slide onto a new slide, using firm pressure to keep the slides touching evenly and flatly as the smear is made (Figure 2). FIGURE 2. In the left hand is a new clean slide; the slide in the right hand has been pressed against the top surface of the new slide to apply the sample to the clean slide and then smear it evenly. Use the smearing slide to pick up another small bit of sample off the sample slide to smear onto another new slide. Continue until only a very little bit of sample is left on the first slide, which is then smeared itself. 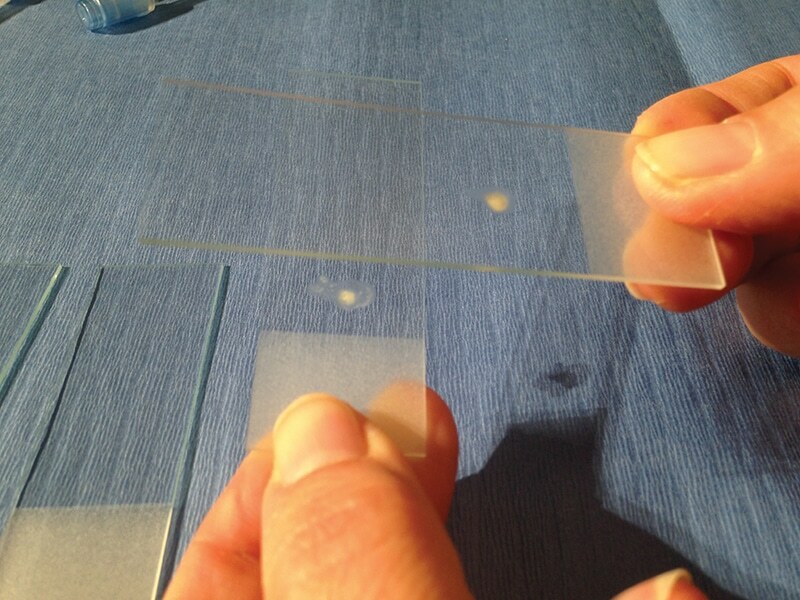 In this manner, at least 3 to 5 good slides are generally produced from one needle sample, allowing for one slide to be stained and evaluated in-house, while other slides can be sent unstained to a clinical pathology laboratory for evaluation. Description. 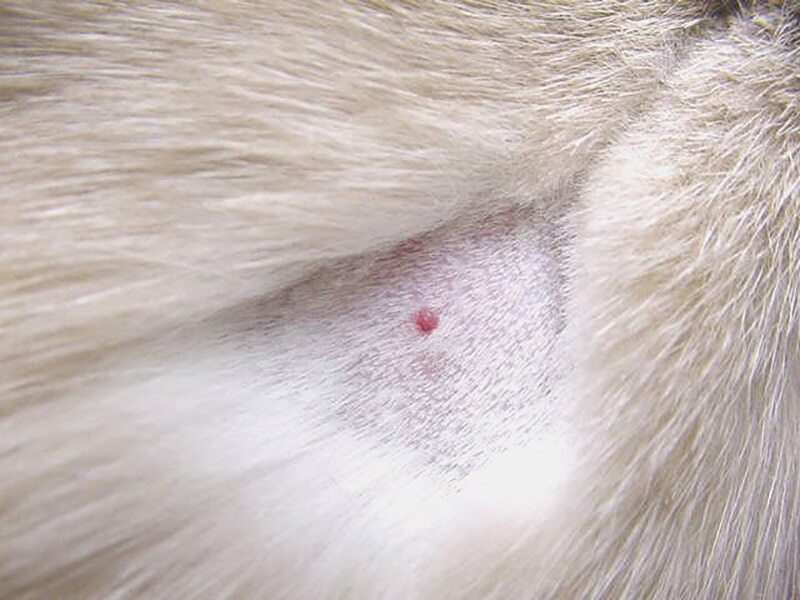 Feline mast cell tumors (MCTs) tend to be small, raised, hairless masses, while canine MCTs can grossly look similar to many different lesions, including lipomas and mammary tumors or infections. Diagnosis. 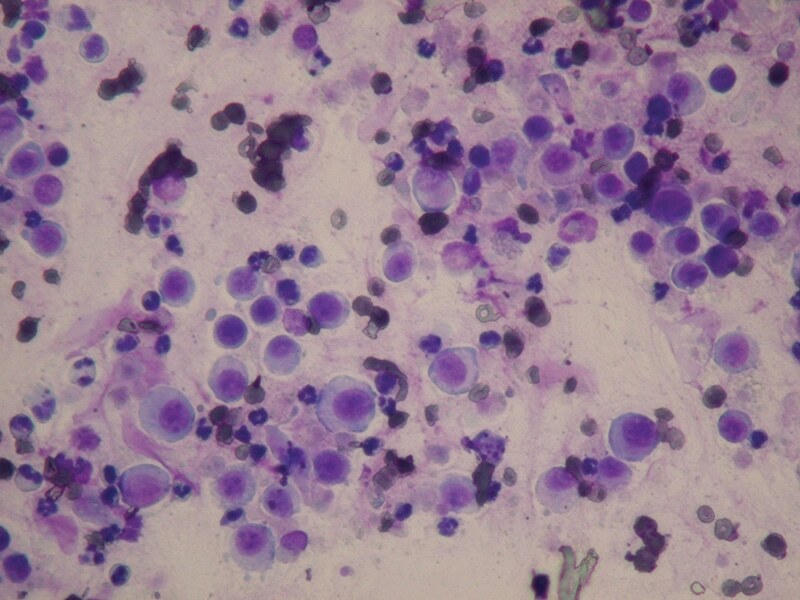 Most MCTs are easily diagnosed via cytology (Figures 3 and 4), although a small percentage of canine MCTs have granules that do not stain well with Diff Quik stain (Figure 5) and must instead have a Wright-Giemsa stain applied (Figure 6). Thus, keeping some of the cytology slides unstained is key. FIGURE 3. Cytology of a feline MCT; note the numerous round cells with purple staining granules (Diff Quik stain; magnification, 20×). FIGURE 4. 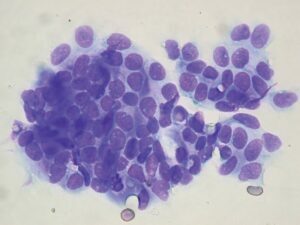 Cytology of a canine MCT; similar to the feline MCT, this slide has a large number of round cells with varying amounts of purple staining granules (Diff Quik stain; magnification, 50×). FIGURE 5. 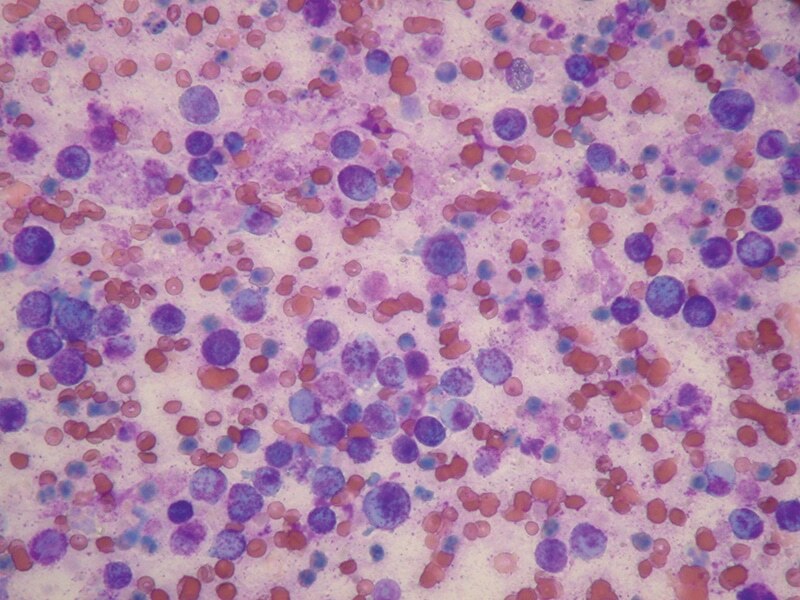 Cytology of a canine MCT showing poorly staining mast cells; scattered red blood cells and cells with segmented nuclei are seen in the background (Diff Quik stain; magnification, 20×). FIGURE 6. Cytology from the same sample as Figure 5, stained with a Wright-Giemsa stain; the mast cell granules now can easily be seen. The red cells also appear much more “red,” and indistinct pink granules can be seen in the segmented cells, confirming that they are eosinophils (magnification, 20×). Management. 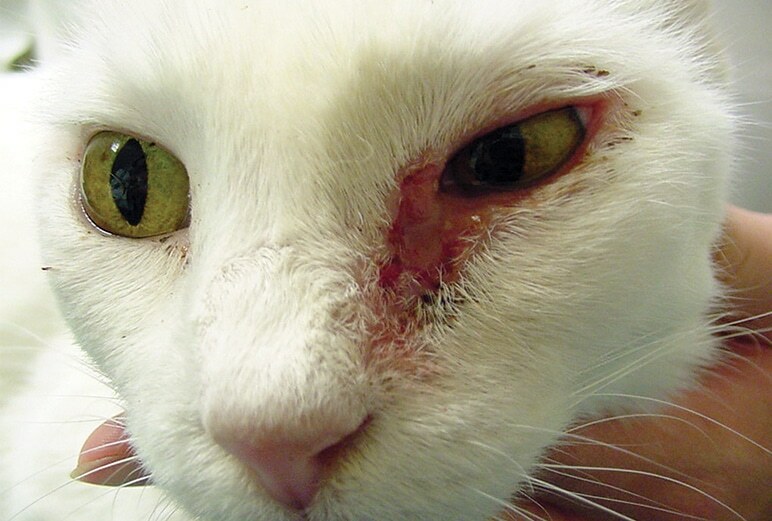 Feline MCTs typically are easily excised with narrow margins, and often completely removed with a lidocaine local block and skin punch biopsy. Canine MCTs are more locally invasive than the feline form; recommendations for complete surgical removal generally suggest excising the mass with 2- to 3-cm margins of visibly normal tissue included. A more recent study2 reported on a modified margin technique in which tumors are excised with lateral margins equal to the widest diameter of the tumor, up to a maximum of 4 cm. Forty dogs had tumors removed with clean margins, 7 had incomplete margins, and only one tumor was suspected to have recurrence. Histopathologic grading is critical to determine the likely systemic biologic behavior of any particular canine MCT, as well as the necessity for systemic therapy after excision. Diagnosis. 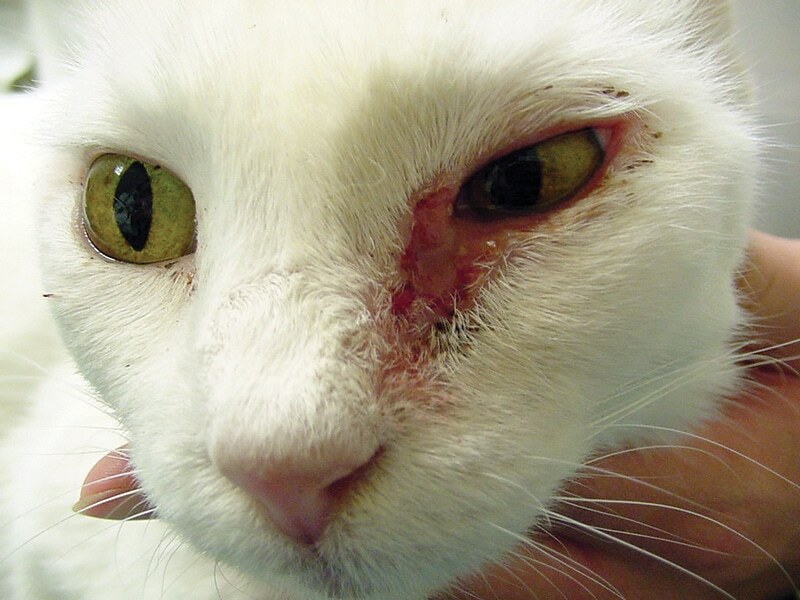 On physical examination, cats present with facial lesions more frequently than dogs, usually at thinly haired areas, such as the ear tips, eyelids, and nasal planum. These lesions are often crusty and ulcerated. In dogs, digital SCC is usually single but may affect multiple digits in giant schnauzers and other large, black-haired breeds. SCC of the digit appears as a swollen digit with an abnormal nail; it is often diagnosed initially as a fractured nail with a nailbed infection (Figure 7). FIGURE 7. 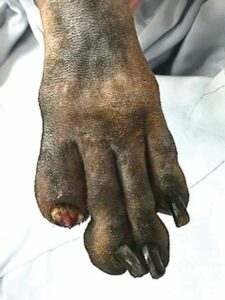 The shaved foot of a Gordon setter with a digital SCC, showing severe swelling of digit #5; a broken toe nail and some soft tissue proliferation with discharge are seen at the nail bed. Cytology can be diagnostic for SCC of the digit (Figure 8). Direct the needle deep into the midpoint of the digit; the bone is often involved and lytic; therefore, a good sample may be obtained from the bone itself. Occasionally, dogs will have so much pain that sedation is needed for FNA. FIGURE 8. Cytology of a SCC; note the large angular cells, some of which appear as individuals, while others appear to be joined. The cytoplasm ranges in color, with many showing deep blue consistent with keratinization. Features of malignancy, including anisocytosis and anisokaryosis, are prominent. Scattered neutrophils are present in the background. FIGURE 9. Erosive SCC at the medial canthus of the left eye in a 12-year-old spayed female white domestic shorthair indoor/outdoor cat. Surgical excision of this type of lesion is not possible due to the diffuse and infiltrative nature. FIGURE 10. 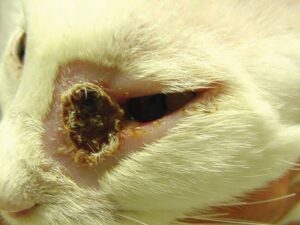 Same cat as in Figure 9, 2 weeks after having the lesion treated with cryotherapy. The eschar will continue to recede and fall off within 1 to 2 weeks. Figure 11. A 4-mm raised hairless lesion on the lateral thorax of a 10-year-old spayed female Siamese cat, diagnosed as a trichoblastoma. The term basal cell tumor was also used as an umbrella term for a large heterogeneous group that included tumors from epidermal, trichofollicular, and adnexal tissues demonstrating basal cell characteristics. This is particularly relevant in cats, in which benign and malignant apocrine ductular sweat gland tumors and basal cell carcinomas are now recognized as having been lumped into the basal cell tumor category. These tumors have malignant potential and, although reports are limited, feline basal cell carcinomas are often highly metastatic. Additionally, while there are no reports of canine malignant basal cell tumors in the literature, veterinary oncologists, including this author, have seen rare cases of metastasis of basal cell tumors in dogs. Basal cell tumors arise in middle-aged to older dogs and cats, with some dog breeds, such as poodles, being over-represented. Diagnosis. Histopathology now differentiates among trichoblastoma, basal cell carcinoma, sweat gland tumors, and other epithelial tumors, but cytologists may still use the term basal cell tumor as a broad cytologic diagnosis covering all of these tumor types. The cytologic diagnosis of a tumor of basal cell origin is based on small, round to cuboidal cohesive cells arranged in tight clumps or ribbons (Figure 12). 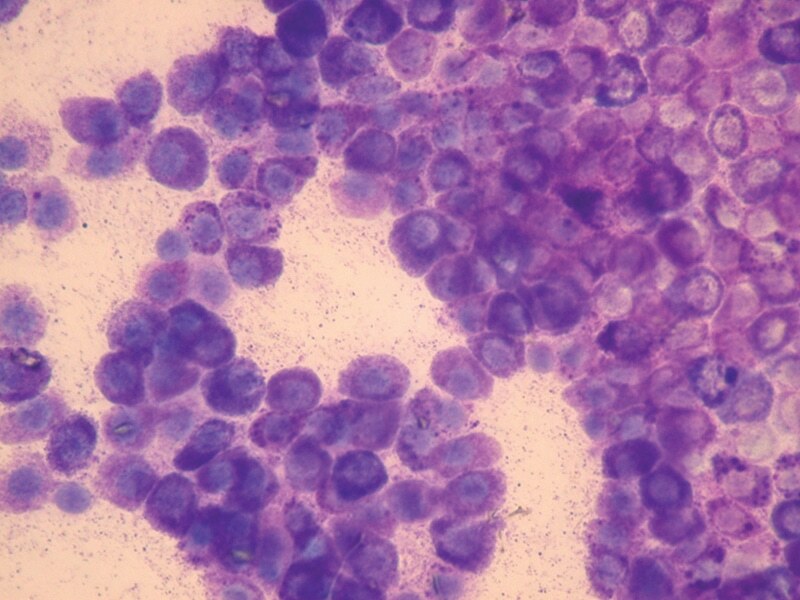 Features of malignancy may be recognized and support a diagnosis of carcinoma, but histopathology is needed to determine the tumor’s malignant potential because the main criterion of malignancy is invasiveness.7,8 Thus, once cytology confirms a tumor of basal cell origin, excision, followed by histopathology, is recommended whether or not cytologic features of malignancy are seen. FIGURE 12. Cytology of a trichoblastoma; note the cluster of small round to cuboidal cells with small amounts of cytoplasm and relatively uniform nuclei (Diff Quik stain; magnification, 50×). Management. Most tumors diagnosed as basal cell tumors via cytology are easily cured with narrow surgical excision. If histopathology reveals a basal cell carcinoma, complete staging, including locoregional lymph node aspiration, chest radiography, and abdominal ultrasonography, is recommended. 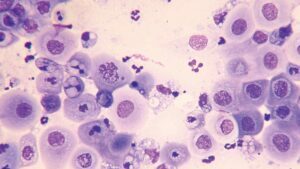 The malignant variant of this disease is rare enough that studies evaluating chemotherapy are not available. 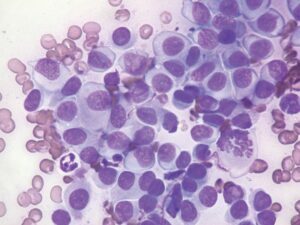 If histology confirms a mass as malignant, chemotherapy may be of benefit. Description. Histiocytomas affect primarily young dogs, but they may arise at any age. These tumors have not been identified in cats. Diagnosis. Grossly, histiocytomas have a distinctive appearance: they are raised, rounded, and alopecic and have small indentations all over (“pock marked”), which create an appearance similar to the surface of a strawberry. The tumors are also described as “button-like” because of their shape (Figure 13). FIGURE 13. A 2-cm diameter, round, raised, mostly hairless lesion on the antebrachium of a 7-month-old castrated male cocker spaniel, consistent with the classic clinical appearance of a histiocytoma. These benign tumors will regress on their own, often over several months’ time. As they do so, the surface may become ulcerated and intermittently bleed. Experienced practitioners may diagnose these tumors on the basis of gross appearance alone, although cytologic confirmation is suggested. On cytology, histiocytomas are in the round cell tumor category. 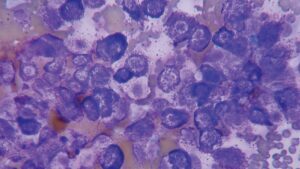 They may be confused with other round cell tumors, such as plasma cell tumors or poorly granulated MCTs. Despite their benign behavior, histiocytomas often exhibit cytologic features of malignancy, such as numerous mitotic figures and marked anisocytosis (Figure 14). Caution needs to be used in interpreting these features, and submission to a cytologist before alarming an owner about malignancy is recommended. FIGURE 14. Cytology of the histiocytoma in Figure 13; note the population of round cells with moderate to large amounts of cytoplasm and distinct cytoplasmic margins (the cells look “outlined” due to clearing of the cytoplasm at the periphery). Prominent anisocytosis can be seen, as well as one mitotic figure (Diff Quik stain; magnification, 50×). Histiocytomas can be routinely diagnosed using a combination of cytologic and gross appearance. As they begin to regress, cytology will reveal lymphocytes scattered among the tumor cells. Management. Excision is generally not needed. It may be recommended if the patient is going to be under anesthesia for a different procedure, such as an ovariohysterectomy, or if the tumor is not regressing over time or begins to grow. Cytology provides a quick and minimally invasive way to evaluate cutaneous tumors in dogs and cats. It may provide a definitive diagnosis and can, thus, help the clinician to determine whether further staging tests, such as lymph node aspiration or chest radiography, are indicated. Even more important, a cytologic diagnosis can help determine the width of the surgical margins needed for complete excision, based on the biologic behavior of the tumor type identified. This preoperative information helps clients avoid the excess expense of follow-up treatment for a dirty margin, and patients the excess morbidity of a wide surgical excision that could have been more conservative. Thus, cytology on cutaneous masses assists the clinician in patient assessment, may decrease discomfort for the pet, and may actually make the treatment less expensive for the client, with better outcomes for all. Ghisleni G, Roccabianca P, Ceruti R, et al. Correlation between fine-needle aspiration cytology and histopathology in the evaluation of cutaneous and subcutaneous masses from dogs and cats. Vet Clin Path 2006; 35(1):24-30. Pratschke KM, Atherton MJ, Sillito JA, Lamm CG. Evaluation of a modified proportional margins approach for surgical resection of mast cell tumors in dogs: 40 cases (2008-2012). JAVMA 2013; 243(10):1436-1441. Belluco S, Brisebard E, Watrelot D, et al. Digital squamous cell carcinoma in dogs: Epidemiological, histological, and immunohistochemical study. Vet Path 2013; 50(6):1078-1082. Miller PE, Dubielzig RR. Ocular tumors. Small Animal Clinical Oncology, 5th ed. St Louis: Elsevier Saunders, 2013, pp 598-599. Gross TL, Ihrke PJ, Walder EJ, Affolter VK. Epidermal tumors. Skin Diseases of the Dog and Cat: Clinical and Histopathologic Diagnosis, 2nd ed. Ames, IA: Blackwell Science Ltd, 2005, pp 589-596. Gross TL, Ihrke PJ, Walder EJ, Affolter VK. Follicular tumors. Skin Diseases of the Dog and Cat: Clinical and Histopathologic Diagnosis, 2nd ed. Ames, IA: Blackwell Science Ltd, 2005, pp 616-619. Bohn AA, Wills T, Caplazi P. Basal cell tumor or cutaneous basilar epithelial neoplasm? Rethinking the cytologic diagnosis of basal cell tumors. Vet Clin Path 2006; 35(4):449-453. Mays MC. Basaloid epithelial tumors of dogs and cats. Vet Clin Path 2010; 39(2):133; author reply 133-134. Laura D. Garrett, DVM, Diplomate ACVIM (Oncology), is a clinical associate professor in oncology and Chief of Staff of the Veterinary Teaching Hospital at University of Illinois College of Veterinary Medicine. Dr. Garrett received her DVM from University of Illinois, completed an internship at University of Minnesota, and completed an oncology residency at University of Wisconsin–Madison. She is a noted national and international speaker and has published on the topics of canine lymphoma, feline hematology, clinical trials, and communication. After working in a New Zealand specialty clinic, Dr. Garret was on faculty at Kansas State University.